SSIS Error 0x80004005 Invalid object name. Applies to: SQL Server 2012 Standard Edition, SQL Server Data Tools 2012. After adding an existing package to an existing SSIS project and updating corresponding project connections, I tried to to run the package and received the following error message. 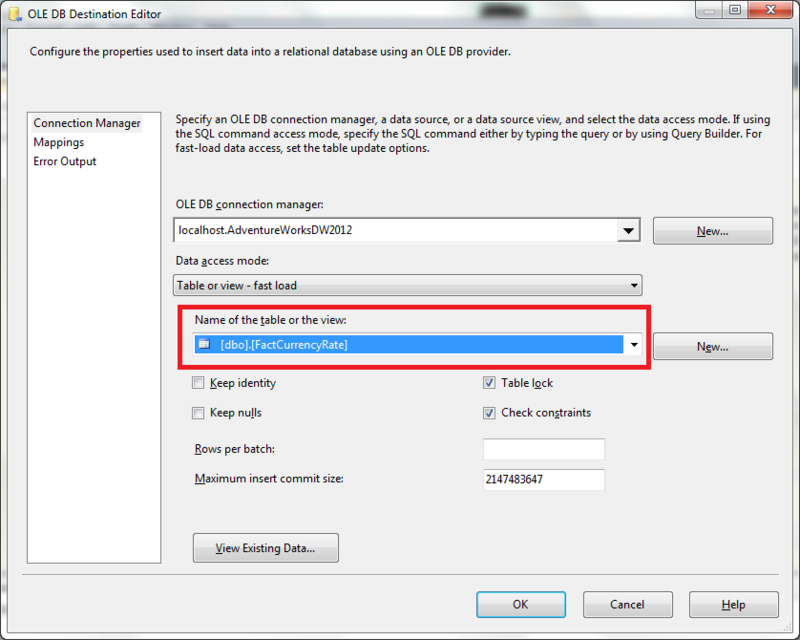 Error at Extract Sample Currency Data [Sample OLE DB Destination ]: SSIS Error Code DTS_E_OLEDBERROR. An OLE DB error has occurred. Error code: 0x80004005. An OLE DB record is available. Source: "Microsoft SQL Server Native Client 11.0" Hresult: 0x80004005 Description: "Unspecified error". An OLE DB record is available. Source: "Microsoft SQL Server Native Client 11.0" Hresult: 0x80004005 Description: "The metadata could not be determined because every code path results in an error; see previous errors for some of these.". An OLE DB record is available. Source: "Microsoft SQL Server Native Client 11.0" Hresult: 0x80004005 Description: "Invalid object name 'dbo.FactCurrency'.". Error at Extract Sample Currency Data [Sample OLE DB Destination ]: Failed to open a fastload rowset for "[dbo].[FactCurrency]". Check that the object exists in the database. Error at Extract Sample Currency Data [SSIS.Pipeline]: "Sample OLE DB Destination" failed validation and returned validation status "VS_ISBROKEN". 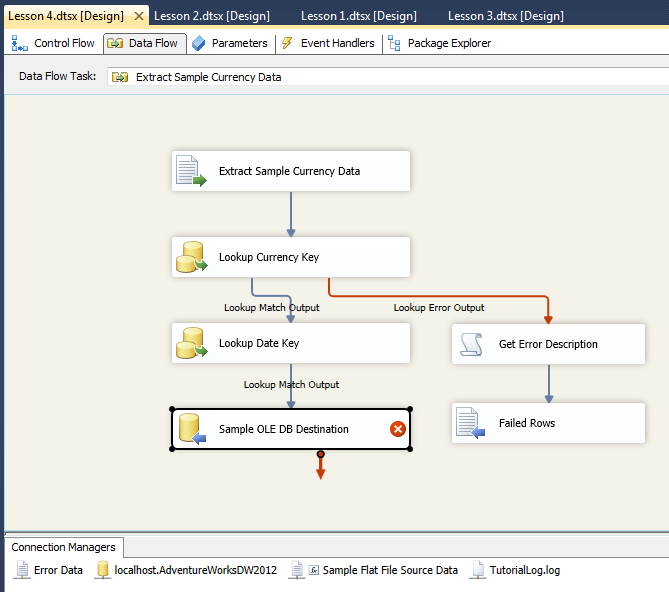 Error at Extract Sample Currency Data [SSIS.Pipeline]: One or more component failed validation. 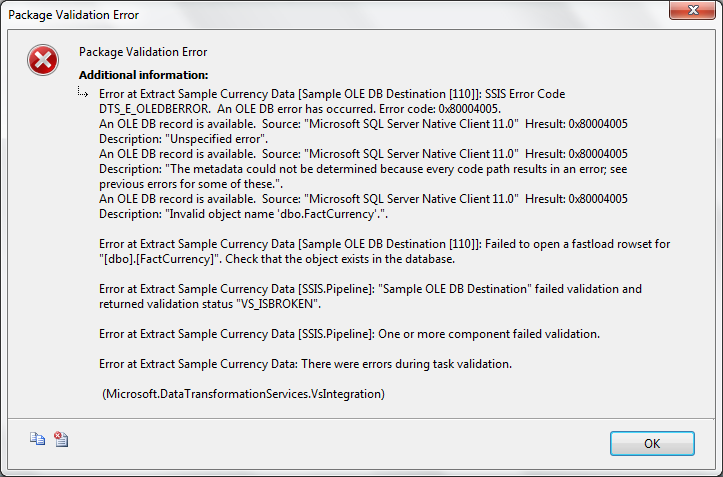 Error at Extract Sample Currency Data: There were errors during task validation. There was an OLEDB Destination task on the Data Flow view of the SSIS package that needed modification since it was making reference to a table named FactCurrency that did not exist on the database. The reference to the FactCurrency table was changed to the table FactCurrencyRate as shown in the images below.